I have to confess, whenever it’s announced that an established artist is set to release a straight ahead dance album, my hackles rise and a deep fear sets in — will this be a genuine attempt to assimilate the sound into theirs, or will it end up being a somewhat cynical collection of disco covers of dubious quality? The shadow of Sheena Easton’s Fabulous looms large. As is frequently pointed out on this site, the release of a cover version often comes at make-or-break point for a hit-starved artist. So when my beloved Cyndi Lauper announced back in 2008 that she was set to release a dance album, I received the news with some trepidation. Surely after the excellent, but poorly marketed The Body Acoustic (which contains another stone cold classic Cyndi ballad, Above the Clouds), the pressure was on for a hit – and why not do this via a disco cover or, heaven forbid, another remix of Girls Just Want to Have Fun? 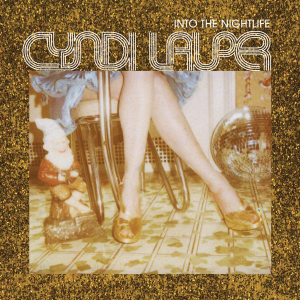 I guess in some ways we had all wanted a pure dance album from Cyndi for some time, but as much as we love the euphoria of a thumping club classic, it seemed sensible to keep expectations on the low side. And when it was revealed that the album was to be called Bring Ya to the Brink — a wincingly awful title, even if it is supposed to be tongue in cheek — it has to be said my enthusiasm levels hit rock bottom. That the subsequent album turned out to be cover free (hurrah!) and in fact totally glorious had a lot to do with Cyndi’s indelible stamp being all over it, and it does in fact include some of her finest songwriting. Her choice of some excellent co-writers and producers to aid and abet her was also spot on and the resulting album was no disco pastiche — it’s a great blend of Cyndi’s signature new wave style with modern dance music. The standout song for me on the album (and the second single to be released) was the unstoppable club anthem Into the Nightlife. Co-written with Max Martin (whose current tally is co-writing 21 Billboard number-one hits, including — gasp — Since U Been Gone, …Baby One More Time, I Kissed a Girl and Shake it Off), it is a propulsive thing, instantly memorable, and very much a Cyndi song, despite the dance trappings. From the throbbing introduction to the background wall of sound (amazing when played loud), this is an all out banger. The album, and Into the Nightlife itself, clearly nod to her LGBT fanbase, but here are dance pop songs for everyone — uplifting, joyous and club-ready. She sounds like she’s loving every minute. Some of the lyrics to Into the Nightlife are suggestively fun — “Shirtless wonders wreck my sight, under the light” — and are made all the more so when erstwhile adult entertainment star Colton Ford crops up throughout the video. Partly filmed at Splash Bar in New York, fans were invited to come along and be extras, and such is the joy of this song that I sometimes imagine I’m right there dancing in the background – until I look at my waistline and realise I’d be the first on the cutting room floor. Here you have one Cyndi’s finest singles, with a bona-fide hit making machine co-writer – it had smash written all over it. That it got nowhere near the UK top 100 is either a sad indictment of our musical tastes or of Epic‘s thinking-firmly-inside-the-box promotion (basically a half-page ad in Attitude magazine). Either way, we collectively lost out. It fared somewhat better in the US, where it deservedly became a huge club hit, topping the Billboard Hot Dance Club Play chart and peaking at No. 5 on the Billboard Hot Dance Airplay chart. Now, Cyndi has had something of a rollercoaster of a career. For such a well known artist her hit rate has been decidedly patchy and she probably has more potential Into the Popvoid entries than any other major pop star. Her magpie-like nature in terms of genre is probably one reason – though, from pop to dance to blues to musical theatre, there isn’t one she hasn’t mastered – and her idiosyncratic style can sometimes draw attention away from her musicality. But beneath the neon hair and Brooklyn accent there’s a world class singer and songwriter, activist, shoe fetishist and all round amazing human being. Her ability to so seamlessly assimilate dance into her sound was a thrilling thing and she looks like she is having so much fun doing so. You can’t help but think the record company really missed a golden opportunity here. So let’s all revisit Into the Nightlife, imagine that at least for one night we have no cares in the world, and dance like there will be no tomorrow. Who could sing this today and have a hit? I’d say Charli XCX could do this justice.